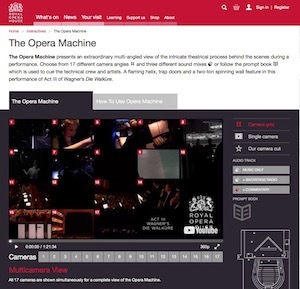 The Opera Machine resource is an excellent way to see the variety of specialisms (and the large number of people) at the Royal Opera House during a show. You can view any of the 17 cameras at any point during the 1 hour 20 minute performance of Act III of Wagner’s Die Walküre, and even follow along with an interactive prompt-script. Electrics: Strand board in FOH control room. Dimmers – 240 (238 x 5kW and 2 x 10kW): 14 presets; groups – 40 memories. Patching system: all battens and cycs; 28 FOH side spots and outlets, 40 on grid, 8 on bridges, 4 on stage. Total capacity available – 1200A on 3 phases. Special effects supply – 480A on 3 phases and 900A on 1 phase, and 2 x 3 phase supplies at 100A per phase. Footlights installed and cannot be covered. Sound: Console in basement. Amplifiers: 6 x 100W, 4 x 50W, 3 tape decks, 1 turntable. Mic sockets – 40 (Reslo), 16 live inputs.